The Shipowners’ Club > News > What is the Condition Survey Programme? The Club’s Condition Survey Programme (CSP) is a key tool used in identifying these concerns. The CSP has been used by the Club for over two decades and exists to ensure that all vessels entered in the Club are in a condition that is of a mutual benefit to all Members. Over 300 vessels are surveyed annually by Club appointed surveyors. 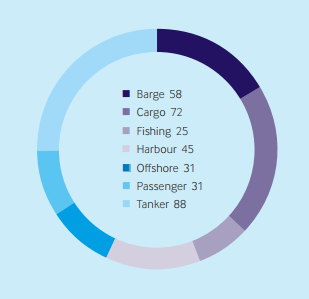 In 2016, the Club carried out 350 condition surveys on a variety of vessels worldwide with tankers, dry cargo vessels and barges being most prevalent (figure 1). The Club’s expertise lie in insuring small and specialist vessels and, as such, the entire CSP has been designed to focus on this niche tonnage. The associated inspection forms are tailored to cater to this tonnage and the department regularly reviews them to maintain their relevancy. The survey forms broadly focus on manning, navigation, management, safety, pollution prevention, structural and cargo worthiness standards on board. This enables the Club to suitably assess all aspects of shipboard/shore operation and management. Profile of the vessel (age, size, type, trading area, type of cargo carried, flag State and Classification Society etc). Reactivation of a vessel after a period of layup exceeding six months. Following a Port State Control detention / ban. With over 32,000 vessels of varied types entered, reviewing reported incidents allow the Club to pro-actively establish developing claims trends. Trends may be identified in relation to a particular region, vessel type, cargo commodity or Member. This information combined with use of the CSP enables the Loss Prevention department to focus on the identified concern in the form of a Concentrated Inspection Campaign (CIC) with the ultimate aim of mitigating an emerging risk. Local surveyors are appointed to undertake these assignments as this reduces possible language barriers and ensures that Members are dealing with a surveyor well versed with local rules and regulations. During their attendance on board, our surveyor is encouraged to interact with the crew and share their observations so the crew both understands the findings and benefits from the survey. The survey findings are highlighted to the Member with the intention of assisting them in increasing the safety level of their operation. The Club recognises that often, some of the risks on board may not be apparent to the vessel’s crew or shore management but when viewed with a fresh pair of eyes, the probability of these being identified and thus addressed is enhanced. The Loss Prevention team are always happy to discuss the results of a survey. The Club considers the CSP to be a proactive benefit to our Members and as such it is imperative that our Members are happy with the outcome. The Loss Prevention team have a wealth of seafaring experience on a variety of vessel types. This, along with the team’s combined Loss Prevention experience, ensures a pragmatic and focused approach towards the CSP. The Loss Prevention department works closely with the Underwriting team to assess risks and with the Claims team to analyse causation and establish developing trends. The Club would like to reiterate to its Members that the CSP is in no way a fault finding or intrusive measure. It is a value-added service to proactively protect Members’ interests by highlighting, and assisting with, potential issues with the sole intention of mitigating risks. Any queries with regards to the CSP may be directed to the Loss Prevention team.